Movie Review: “Spectre” is a quite unproductive installment (the 25th!) of the James Bond/007 franchise. For the second time in a row, director Sam Mendes guides Daniel Craig, who together with the voluptuous French actress Léa Seydoux, disseminate charm without particularly delivering anything worthy along its overextended 148 minutes. The film opens energetically active in Mexico in the Day of the Dead, with Bond jumping from building to building until he reaches the skies in a rampant helicopter where his main target, Marco Sciarra, who was plotting to blow up a stadium, is finally killed. Before Sciarra's fatal fall, the secret agent managed to pull out of his finger a ring with an octopus engraved. Then he flies to Italy, disobeying his boss’ orders, to attend the victim’s funeral, where he feels dangerously attracted to Sciarra’s beautiful wife and also learns about Spectre, a global criminal organization that operates in the shadow. By making use of the ring, he’ll try to infiltrate himself in a meeting of the organization that, after all, divides itself into another sub-organization with multiple connections to different possible targets. Encounter after encounter, all of them with some friction associated, Bond will bump into a dissident Spectre member who before killing himself, asks our hero to find and protect his precious, intelligent daughter, Dr. Madeleine Swann (Seydoux). After the usually difficult first contact, Bond saves her in a ridiculous way, using a jet plane, when a few thugs were taking her hostage in a jeep. The couple, far from incendiary, confronts the man behind Spectre, Ernst Stavro Blofeld, an inadequate villain unimpressively embodied by the gifted Christoph Waltz. 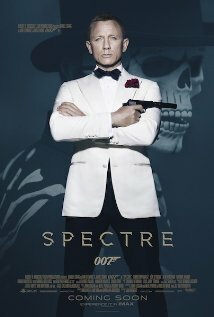 More boisterous than intriguing, “Spectre” only sporadically amuses, relying on a collection of messy action episodes that have nothing to add to the previous installments. The four screenwriters - John Logan, Neal Purvis, Robert Wade, Jez Butterworth – have much to be blamed for the story’s lack of grip, but the truth is that the execution also didn’t appeal to me with its super-exaggerated scenarios and the excess of confidence of a more and more decaying super agent that once made my youth days merrier.